Use the form below to contact cruise Pelican Cruise 3 days tour directly. Pelican Cruise 3 days 2 nights give more opportunities to explore out of the way places and indulge in the natural wonder of Halong Bay than the 2 day 1 night Halong cruise tours. See the magnificent limestone islets and outcrops lined-up across the emerald sea. Explore a remote fishing village to view the daily lives of the locals. Kayak unspoiled lagoons, sliding past deserted white sand beaches and awesome limestone karst formations. The three day-two night escape is ideal for keen novice or experienced kayakers, swimming and communing with nature. The perfect option for the return visitors to Halong Bay, or for the travellers yearning for a truly authentic Halong Bay cruise experience. 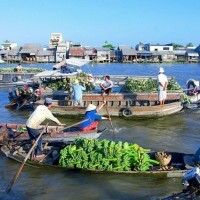 7.30 am – 08.00 am: Pick up from your hotel in Hanoi. Drive to Halong City through the paddy fields in the Red River Delta. chance to see monkeys on islands. 17.15 – 17.50: Visit the beautiful Soi Sim beach for swimming (if the weather permits) or you can reach on the top of Soi Sim beach to have a panorama view of Halong Bay. 17.50 – 18.15: Back to the boat and free time. Massage service if order. 18.30 – 19.00: Cooking class on sundeck – How to make Vietnamese spring rolls. Then enjoy Happy Hour (buy two drink, get one free from 18.00 to 19.00). It is time for chit chat and relaxing. 21.30 – 23.00 Evening activities include: Leisure time to enjoy a chat around the bar. Watching movies and many sorts of Vietnam cultural films. Relaxing and spending a romantic night on Pelican Cruise’s music. Playing cards, chess are available, reading magazines in room and dining room. Passengers may also try their luck with squid fishing from the boat. 06.15 am – 06.45 am: Enjoy Tai Chi instruction on the sundeck (duration about 30 minutes). 10.30 am – 11.15 am: Visit exciting Vung Vieng fishing village by local rowing boat, the village is free from busy roads and streets, and skyscraper. Instead, there are only a few of boats and rafts. 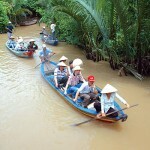 You will have chance to discover traditional culture and customs of fishermen. 11.15 am: Back to cruising. Vietnamese Lunch is served on boat. 21.00: Evening activities include: Leisure time to enjoy a chat around the bar. Watching movies and many sorts of Vietnam cultural films. Relaxing and spending a romantic night on Pelican Cruise’s music. Playing cards, chess are available, reading magazines in room and dining room. Passengers may also try their luck with squid fishing from the boat. 09.00 am – 9.30 am: Return to the boat then check-out and payment at reception area. 10.00 am: Have buffet brunch while cruising back through Halong Bay to the pier. Relax on the sundeck or in the dining room enjoying the bay scenery as we approach the pier. Children from 05 – 12 ages Stay with parent 75% charge of adult price. Thank you for visiting our Pelican Cruise 3 days tour . We are looking forward to serving you. What to do on Phu Quoc Island ?